Home » Husqvarna Viking » Husqvarna Viking Opal 690Q » Sewing: More Brilliant Features! The Husqvarna Viking 690Q has so many features – it would be easy to get overwhelmed. I’m happy to say that if you just want to sew – it’s easy. Just turn it on, add your 1/4″ piecing foot and sew. Leave all the fancy stuff for another day when you’re more comfortable with the machine. Let’s have a look at how easy it is to get sewing: more brilliant features. The Opal 690Q has THREE LED lights – one on the arm of the sewing machine and TWO on either side of the needle. In addition to the light in the arm of the sewing machine, the OPAL 690Q has two LED lights – one on either side of the needle. This certainly makes seeing your work much easier. In the setup menu, you have the choice of turning on the needle width safety feature. If this safety feature is engaged, this is the pop up message you’ll get if you try to use a stitch other than the straight stitch. You also get this message if you try to move the needle left or right. This is certainly an excellent feature if you want to use the single hole throat plate or you are using a presser foot with a single hole. This feature will stay programmed until you change the setting, even if you shut off the machine. 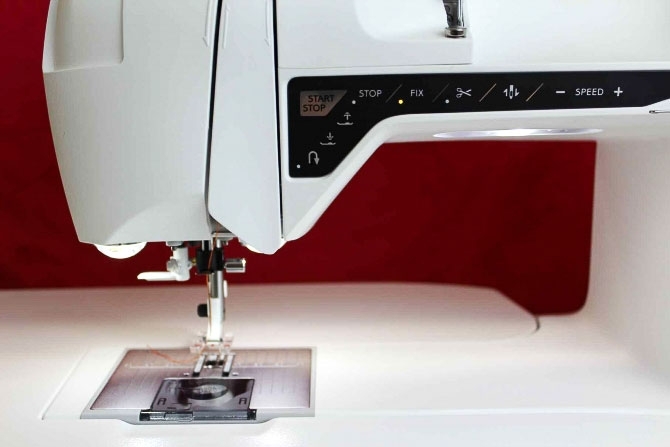 There are several ways to set up the Opal 690Q for the 1/4″ seam allowance. The simplest way is to turn on the sewing machine. Pop the Quilter’s 1/4″ piecing foot P onto the machine and sew. It’s as easy as that! The other way is to choose the preset 1/4″ setting from Stitch Group 2, stitch No. 1. The needle is moved to the right (the setting is 1.8 on the touchscreen). Using the edge of Utility Foot A – you get an accurate 1/4″ seam. Many of us are used to a particular style of 1/4″ foot. You can easily adjust the Opal 690Q to get the setting that you want. Just shift the needle to right to get the appropriate seam allowance. The needle has TWENTY -NINE settings so you are sure to find one that fits your sewing needs. When the needle is at the extreme right – on the touch screen, we see the needle “width” is 3.5. The needle in the left most position. If you’re in any position on the left or right and want to get the SAME position on the opposite side – a quick tap on the Mirror Side to Side button – will move the needle the same number of spaces on the other side of the needle. This is a super feature if you’re trying to get two lines of top stitching or decorative stitching on either side of a seam or center line. The seam is pressed to one side (as we commonly do in quilting) and you cannot see any of the white thread on the right side of the sample. This means the tension is perfect and I did not make any adjustments. The Exclusive SEWING ADVISOR set everything for me. Now, you’re NOT allowed to laugh at me, but I always thought that a couple of the stitches on most machines were a form of applique stitch including a SLANT blanket stitch although, why you would want a slant was beyond me. However AFTER reading the manual – I learned that these stitches are in fact overcast stitches. AHA. I told you that I’ve been learning a lot by reading the manual. OK – so I do NOT need a serger to finish the edges of clothing or fabric that frays a lot. I must admit that I didn’t know how to do this. A quick visual in the User’s Guide and oh…this is going to be easy. The Husqvarna Viking Opal 690Q offers me several choices depending on whether I want to just overcast the edge of a seam that’s already sewn or whether I want to sew the seam and finish the edge at the same time. There are also several other settings if you’re using stretch fabrics. The best part – based on your input, the Exclusive SEWING ADVISOR will adjust the settings for you and tell you which foot to use. Reading the manual makes me laugh. It reminds me of getting a new cell phone – we tend to just scratch the surface of what our devices can actually do. Since we tend to keep a sewing machine longer than a cell phone – I highly recommend reading the manual. Sometimes the biggest issue is NOT knowing the capabilities of our sewing machines. The seam and overcast done in one step. Thanks to the Edging Foot J – it was so easy to keep the fabric in the right position. The over cast seam on the outside. Again the tension and stitch length were set by the Exclusive SEWING ADVISOR and none of the white thread shows through. The Sensor One-Step Buttonhole Foot attaches to the Opal 690Q like a regular foot with the added step of plugging in a small cable just beside the needle. Easy to do. I have to ‘tell’ the Opal 690Q how large a button hole I want. A handy measuring device in millimeters is on the front of the sewing machine. Just lay your button on top of the guide and you’ll see how big the buttonhole needs to be. In this photo – you can see that I entered 19 as the length required for the buttonhole. There are several styles of buttonholes available depending on the type and thickness of fabric that you are working with. Again – once the appropriate buttonhole has been chosen, and the type of fabric, the Exclusive SEWING ADVISOR takes over and makes the right choices for tension and stitch length. If you’re not into hand sewing, the Husqvarna Viking Opal 690Q will even sew on the buttons for you. There’s a preset stitch to make this happen. In this screen shot, you see that preset option to do 8 bar tack stitches to secure the button. You can override this setting. The normal setting for the width between the holes is 3.0 and this can also be modified if necessary. It’s a GOOD idea to verify this setting by moving the hand wheel by HAND to avoid breaking the button or the needle. If you want your button to have a thread shank, simply insert the Multipurpose Tool/Button Reed underneath the button before you sew it on. Otherwise just sew the button directly to the fabric. Remember to take the presser foot off and just use the Presser Foot Ankle to secure the button in place while you’re stitching. Although I did admire the design and shape of the Extension Table when I set up the Opal 690Q, I did NOT appreciate it until I started to sew. The curve on the front of the table is a BRILLIANT design. Your hands sit so comfortable on the table, there’s no sharp edge to dig into your wrists. And imagine what it’ll be like to sew or quilt something large. There’s NO danger that those items are going to be hampered by drag as the edge of the extension table is so smooth – the items will just glide over the curved edges. Kudos to the designers for this ingenious touch! The Husqvarna Viking Opal 690Q is a sewing machine that’s rich with amazing time saving and safety conscious features. In addition, the design elements show that much thought went into how we actually sew. These new design elements and features will make sewing more comfortable and rewarding. Sewing: more brilliant features! You won’t be disappointed. Tomorrow, I’ll show you my favorite applique stitches.